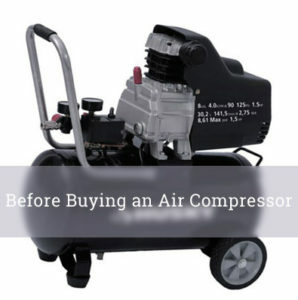 If you will dissect the parts of your air compressor, you will find one of the most important elements of machines that deal with air compression: Husky air compressor filter. Basically, air compression works by removing water, oil, dust, and other contaminants from the air supply being compressed. This process is facilitated by the filter. The filter serves as a purifier so that the air that is being delivered will be free from materials that can clog the other parts of the compressor. Aside from the air compressors themselves, Husky also offers a wide array of filters. 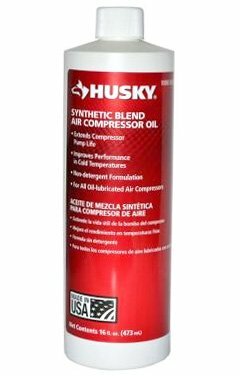 From water filters to intake air filters, Husky can give you the perfect fit to your compressor. Read on and learn more about these filters. All air compressors have an intake air filter. It is called as such because the filter is usually installed on the intake opening. Depending on how often the compressor is used, this needs to be changed regularly to avoid clogs and a decrease in the capacity of your pump. If the filter already has a certain amount of build-up, the machine will be forced to work harder. Eventually, the parts will be burned out easily. To replace the dirty filter, simply remove the Husky air filter housing cover and install the new one. Husky air compressor filter models range from 1/4”, 1/2”, and 3/8’’ inch sizes so you need to know the size that will fit in your compressor. You can determine this by reading the manual of your compressor. Air compressors also have a water filter. Believe it or not, water can destroy the entire machine in an instant. Where does this water come from? In simple terms, the water forms as a result of condensation of air. This happens when hot air that is pushed through hose and tight fittings come into contact with cooler air. To filter water, you can either use aftercoolers or dryers. Basically, the role of an aftercooler is that it cools the air temperature as it is discharged from the air compressor. This will cause the moisture to turn into a liquid state (condensation). Immediately after, the water can be removed from the system to prevent damage. The aftercooler is a very efficient water filter because it can remove around 60% of moisture from the air. A dryer, on the other hand, will filter moisture by reducing temperature. Doing this will lessen the moisture brought about by condensation. It can remove 30% of moisture from the air. An aftercooler and a dryer can both be hooked to your air compressor for maximum water filtration. Husky also offers aftercoolers and dryers. Its HS7810 air compressor aftercooler is very compact and can suit various models. There is also the HS781002AJ model that has a very high efficiency. These water filters are very durable and can be easily installed for your own convenience. Aside from the water and intake air filter, you also need to have a coalescing filter to filter other materials that the former two cannot. 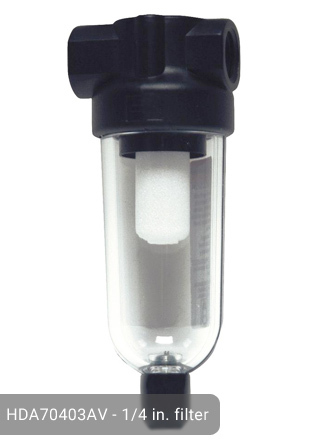 Coalescing filter removes solid particulates in the system. These include rust, dirt, and small metals. These materials are dangerous because they can block certain parts and halt the smooth flow of air delivery. 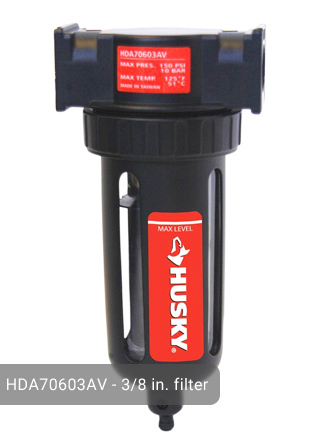 Husky 1/4-inch air compressor filter has the ability to remove both water vapor and dirt particles. It has a 21 SCFM flow capacity at 90 psi. It is very effective because it can remove dirt which are larger than 5 microns. 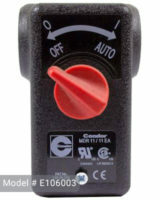 The filter can be mounted easily on the compressor. Another model that is recommended is Husky 3/8-inch Standard Poly Bowl Filter which was designed to keep air lines free from condensed water and dirt which are also larger than 5 microns. It has a higher flow capacity (57 SCFM at 90 psi) than the 1/4-inch model. Similar to choosing the right air compressor, there are certain things that you need to consider when selecting the best filter that will work for your air compressor. First, check the physical aspects of the filter. These include but are not limited to the diameter of the inner and outer portion, its height, and even its porosity. In terms of functionality, check the maximum flow, surface area, and its efficiency. If the Husky air compressor filter meets your own requirements for these criteria, then it is probably good for you. Although Husky has everything that you need, it is still highly recommended that you check the specifications of your air compressor. 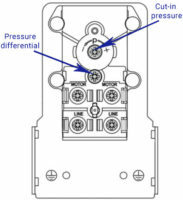 The 3/8-inch bowl filter will work with various models of air compressor but if you do not have the correct air plug/fitting, you will not be able to connect it to the compressor or air line. In the end, you will just waste your money by purchasing something that you won’t be able to use. Maintenance of filters specifically the intake air vents should be done on a weekly basis. You should remove the debris and other materials that obstruct the filter. You can simply wipe the filter to clean it. For air compressor materials by Husky, you do not need to do weekly maintenance cleaning only if you rarely use the machine. If this is the case, you can just clean the filter after the 5th time that you use it. Every single part of an air compressor matters. When one becomes dysfunctional, there is a high probability that the entire machine will stop functioning. You should always be prepared to have extra parts in hand should there be a need for a replacement. If you want to make your life easier, check out our website or your local store and search for Husky air filters. Everything that you need is there. A filter would not cost you more than $20. With this cheap price, you will be provided with the durable and high-quality filters that will last for a long time. Husky will never let you down. If you have a question or want to share your review about these products feel free to do this through the form below. I have a Husky 1/4 in. Air Compressor Filter SKU 401910. How do I remove the glass bowl to clean the inside? Hi Larry. Most of the glass(carbonate) bowls installed in the filter housing using a thread or a sealing ring. But before that, make sure that the bowl has no thread or you can break it! If it has thread you should turn your bowl in a counterclockwise direction to unthread it. I purchased a Husky 3/8-inch Standard Poly Bowl Filter HDA70603AV at Home Depot a while back (6 mos) and just installed it. per instruction (Flow direction, etc.). When I turned on the compressor, I noticed rush of air coming out of the valve. The valve on the bottom of the bowl would not close. Should this valve have threads? It just spins. Is this a defective valve? It only cost me $23 but just for the heck of it I thought I would ask what is wrong before I buy another. It also came with no brackets to support it. I thought that to be strange. Please advice.